Reading Harold Rosenberg’s essay on Marcel Duchamp’s L.H.O.O.Q. Rasée (shaved), titled “The Mona Lisa Without a Mustache,” I’ve got some thoughts. The essay deals with Duchamp’s work wherein he graced Leonardo’s ubiquitous image with a fancy moustache and goatee (in 1919), and then (in 1965) mounted a reproduction of that original, “rasée,” onto a party invitation. The whole thing’s pretty funny, but it’s more than a gag. How did Rosenberg forget to mention Duchamp’s sendup of gender roles; why did Rosenberg omit the “Shaved” part? To make this distinction in the essay, to call it, say, “Mona Lisa, Shaved” might have better indicated that the female figure once had a mustache, and now, doesn’t. To me, that makes a big difference. “The curious thing” Duchamp said, “about that moustache and goatee is that when you look at the Mona Lisa it becomes a . . . real man.” All this isn’t just anti-art. L.H.O.O.Q. 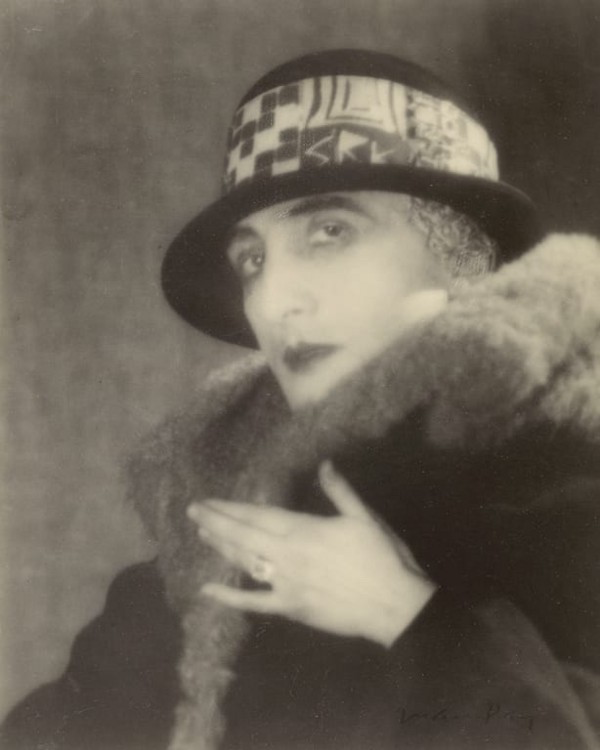 (and Shaved) came along, followed by the performance— in the tradition of androgynous self-portraiture — en face as Rrose Sélavy (1921), in drag if you will. Till as late as 1923, Duchamp would sign his letters, “Affectionately” or, as in one letter, “flowers for you” from Rrose Sélavy. For that period of time, who or what was the real Duchamp, and who’s to say? I like to think that both Rrose and Marcel were both just as truly him. In the case of the assisted-readymade facial hair, and this late-twenties mask, were these just goofs on outward appearances, or is there a deeper commentary about the role of gender here? In the above-mentioned essay, Rosenberg had a prescient (and pre-internet) idea that no popular culture exists anymore, that all images were then beginning to mingle together in our imagination. (Imagine if he lived with Tumblr, Instagram, etc.) He went on to say that “in this time, there are only one-person cultures, which each of us pieces together as best we can.” It’s a deceptively apt statement on the turn that our culture has made due to tech. But relative to Duchamp’s gender-bending, first in L.H.O.O.Q. and later in the makeup of Rrose, it’s just his nature to pull back the curtain mid-performance — and this is as critical as you can get. Critical of convention, of tradition, of expectation. One-person cultures are bred and fed by mass-production and also tech. With that kind of setup, there’s the feeling that we don’t need each other — maybe that we won’t fight for or with, but only against each other, for our own ideals, to protect what’s ours. I think this is misguided. That which is mine is often also that which belongs to someone else, maybe some larger untouchable or unseen entity. Humans need others as we always have, especially in this horrible paradigm. But the life has always had complications. We catch glimpses of one another newly, as ever — amid some mediation or other, the performance of different roles, masks, identities. Duchamp reminds me of the fact that we can flip life on its head and meet each other in all our variousness — in excitement of what’s possible. 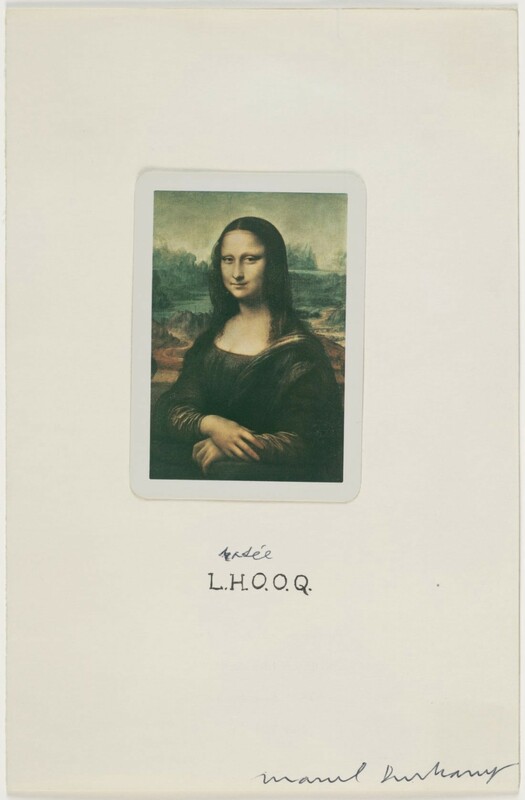 Marcel Duchamp, L.H.O.O.Q. rasée (1965), Playing card with colored ink on printed invitation.